Red Cherry Eyelashes ~ Yellow Canary A bright splash of yellow upon your eyes. Lush lashes transforming your look, and garnering the attention you seek. These yellow, party lashes from Red Cherry, pop beautifully against your fair skin. 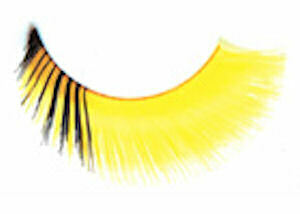 The long, bright yellow lashes reflect the light at all the right angles, and shine brighter then the sun. The inner portion of the lashes display a few strands of black that only add to the desired look. Made with our reliably, high quality synthetic fibers, and combined with our lash adhesive (found below), you will never have to worry about these lashes failing you. They stay firm, until you decide to remove them. A great way to complete any style with a flash of brilliance in a moments time. Applying your new lashes remains a simple process when wearing Red Cherry. Don’t get stuck in front of the mirror forever with those other lashes you found elsewhere.